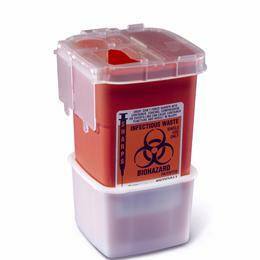 Phlebotomy Containers: Portable Sharps Containers Are Designed To Fit Into Blood Drawing Trays, Also Provides Point-Of-Use Disposal And Features A Square Base For Added Stability. Choice Of Single Or Dual Openings Accommodates A Variety Of Sharps. Containers Lock For Final Disposal And Safe Transport. 1 Quart.